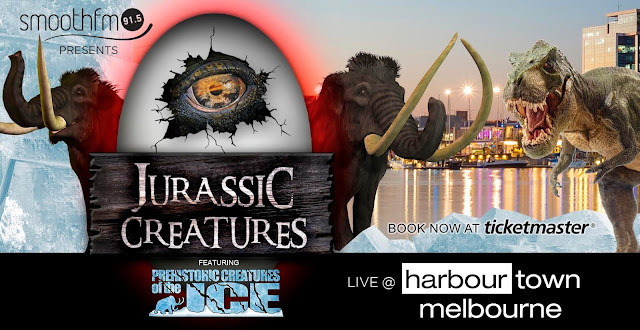 MELBOURNE, ARE YOU READY TO STEP BACK IN TIME WITH THIS CHILLING ADVENTURE TO THE ICE AGE? Jurassic Creatures, featuring Prehistoric Creatures of the Ice is an interactive walk through event that will captivate young and old alike. Explore an ancient world full of moving dinosaurs and prehistoric creatures of the ice. Get ready to be amazed and thrilled as the greatest creatures ever to walk the earth return and come alive before your eyes. Jurassic Creatures exhibition will have you seeing interactive creatures of the ice, watch them move and hear them roar. You will be able to see some prehistoric animals like the colossal Mammoths, fearsome Saber Tooth Tigers and the Tyrannosaurus Rex. You will not be able to see more real than this, step back in time to when you weren't around. Become a Paleontologist for the day. Children can unearth their very own fossil, in a provided expert digger outfit to look the part. Meet Buddy & Tiny from Dinosaur Train, as well as see them live on stage for their very own show. Enjoy dinosaur art and craft, fossil displays and amusement activities. Jurassic Creatures is an interactive event like no other that will capture the imagination of children & parents everywhere. I know my little Niah will be excited to see the T-Rex. My little darl is dinosaur crazy! When: Jurassic Creatures will open 12th March to 17th April in the docklands of Melbourne. Various show times are available to see, which you can view HERE. Where: Harbour Town, Melbourne. Jurassic Creatures will be located towards the Melbourne Star (opposite Costco). Cost: $32 for adults, $26 concession, $22 children (under 2 free) or family pass (2 adults, 2 children) $105. To purchase tickets and see session times visit HERE. We have a family pass to giveaway to one lucky reader valued at $105. Show times can be selected at the winners discretion. Simply fill in the gleam form below to enter. Giveaway ends: March 7th at midnight. Winners drawn and announced: March 8th. Winners must contact back within 24hrs otherwise redraw may occur. Disclosure: This post is brought to you by Jurassic Creatures. I will be receiving complimentary tickets to Jurassic Creatures in exchange for its promotion here. I received no payment for this review and all opinions expressed in this post are entirely my own. My youngest daughter and my son would both love to see the dinosaurs. Sometimes it sounds prehistoric in our house with their conversations!!!! Would love to see this with my kids. I would be the one most interested in seeing this. My 2 Dinosaur loving boys would love this so much. Dinosaurs, dinosaurs, my nephews love them all. One horned, two horned, big or small! Probably me, I'm such a big kid! My 4 year old son is dinosaur mad. He borrows the same dinosaur book from kinder every week. I know it off by heart now. I would love to take my kids it would be such a fun day out! my niece and I would absolutely love this! I always play dinosaurs with her! My son would love to unearth his very own fossil. Great that you can pick a session that suits and always good to visit Harbourtown.